This post is somewhat related to my last post that discussed using the Web Dev Server, that ships with VS, to hit ASP.Net web pages from a unit test. In this post I’m going to cover how to fake a user initiated post back from C# code, this example will mimic a button click but should be easy enough to adapt to another control. So when I came up with this approach I wanted to test that a particular class could be successfully serialized into the View State of a page and then successfully de-serialized in a post back. This is interesting because the view state is maintained in the request/response, rather than on the server, me we need to simulate the manner in which a browser would transfer this information. I’m just going to work with the Default.aspx page that is created for you and adding a single button to the page, I’m leaving it aptly named “Button1”. If you double click on the button VS will drill through to the code behind where you should now have two methods, one that runs on page load and another when Button1 is clicked. At this point I’m going to add in a class to test, sticking with original scenario I’m going to verify that am instance of this class can be placed into View State and pulled back out on a post back. I’m adding in a very uninteresting Person class that has two string properties as shown below, note that I’ve marked it as serializable otherwise we won’t be able to put into View State. Now I’m going to fill out the code file for my ASPX page to add a person into View State when a page is requested and to read it back out when Button1 is clicked. 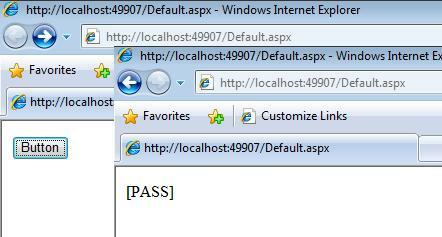 The page will then write out [PASS] or [FAIL] and send the response back. At this point you should be able to run your project and when clicking the button a simple “[PASS]” should be written out for you. 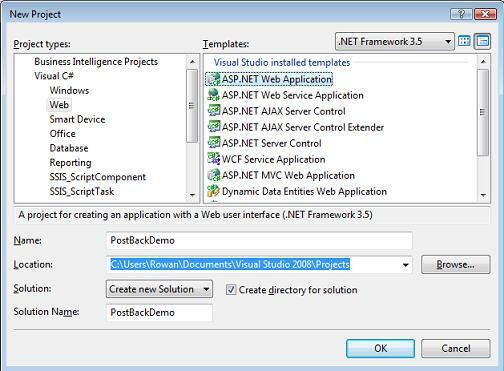 We are going to create a unit test using the inbuilt test framework in Visual Studio, for the purpose of this demo our test is going to rely on the page being available on a given url but if you combine this post with my last post on hosting pages within a unit test using Web Dev Server you can accomplish a truly automated solution. So I’m just adding a new Test Project to my solution (File -> Add -> New Project -> Test -> Test Project), I’m calling mine TestProject. I’m just going to add my test code into the TestMethod1() that is created for you in UnitTest1.cs. Now the code to achieve what we want is actually pretty simple, I’ve posted a few topics now that use Systme.Net.HttpWebRequest and System.Net.WebResponse to hit resources over http, this one is the same except that we need to extract some content out of the initial response and include it when we post back. The initial response contains two hidden controls called __VIEWSTATE and __EVENTVALIDATION we simply need to copy the content of these controls and include them in our second request. View State is pretty obvious and includes the serialized version of our person instance. Event Validation isn’t so obvious, this is an internal construct of ASP.Net that is used to help guarantee the integrity of the page content, you can read more on that topic at http://msdn.microsoft.com/en-us/magazine/cc163512.aspx. You’ll also notice that I’m including “&Button1=Button1” at the end of the content, this simply identifies that Button1 was clicked and ASP.Net raises the ‘Clicked’ event on Button1 for us when it sees this. The other noteworthy part of the code is the use of a delegate to perform the writing of content to the post back request stream, you could equally have this logic tucked into a method somewhere. Note that you will need to add a reference to System.Web and System.XML in your test project and the corresponding using statements at the top of UnitTest1.cs. I’ll also just reiterate that you will need to have the aspx page available and replace the first string variable in the code below with the url of your page, if you want your test to deal with spinning up the page see my last post. else if (xmlRead.Name == "input"
Coming up with this approach code was actually quite simple, once I had the web page up and running I used an HTTP tracing utility to work out what was getting sent to and from my browser and then just wrote code to mimic that. I was using Http Debugger Pro from http://www.httpdebugger.com/ but there are plenty of alternatives out there. If you want to mimic user interactivity with an ASP.Net web page then you can achieve this pretty simply using functionality shipped with .Net in the System.Net assembly. This can be useful for lots of reasons including automated end to end testing of web based scenarios.